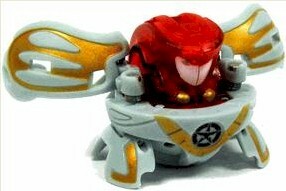 Moonlit Monarus is a Special Attack Bakugan that weakens its opponents with its special abilities. This butterfly type monster uses its huge wings to disguise its appearance as a larger, more fierce creature. Its armor may be thin, but Moonlit Monarus proves difficult to attack with its increased speed. When darkness shrouds the battlefield, lights on its wings can blind a foe. Moonlit Monarus is a part of the Special Attack Series. Its special attack feature is that it lights up. Its Haos version has 710 Gs. It looks exactly like Monarus, except Monarus does not have a red head and does not light up. It was only released in Haos, but there are pictures of it in Ventus. Purchase your Moonlit Monarus from Amazon now!